Here's a sketch for my latest monkey painting which I will post very soon. It's time for another hokum image! 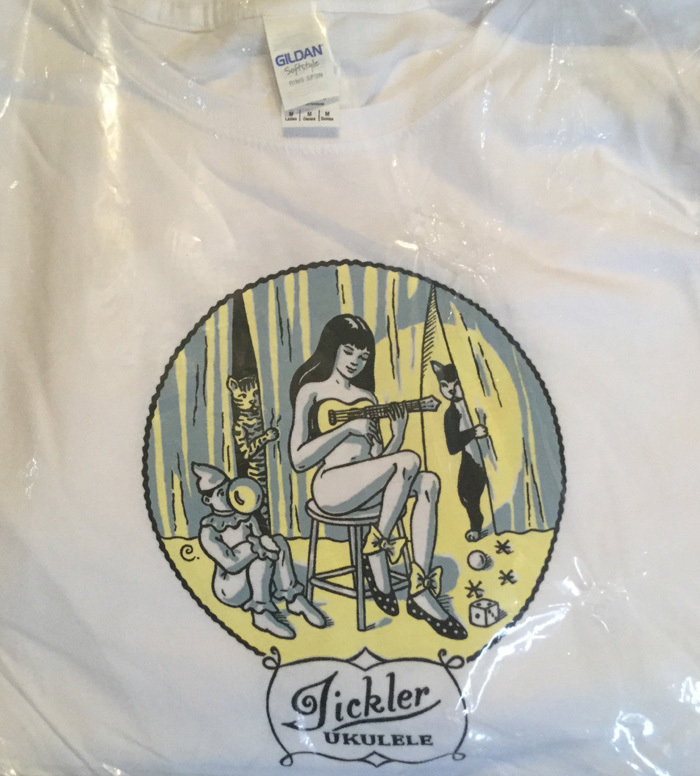 The Pierrot is traditionally a love sick clown in white dating back to the 16th century Italian Commedia dell'arte. 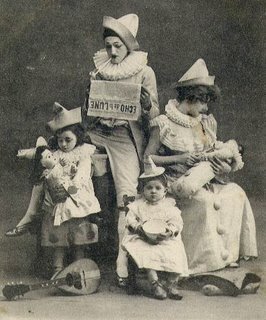 Here is an image from a vintage French postcard which I find rather charming. I'm in love with Leonard Cohen or, at least, his music and words. That makes two of us: Prince Charles and me. I will now admit that I listened to his albums over and over and over again when I painted my "Little Pierrot Series". I tried to listen to other kinds of music, but they did not put me in the right mood. I had to get into the Leonard Cohen groove. Every last one of my little pierrots was painted under the influence of L.C. 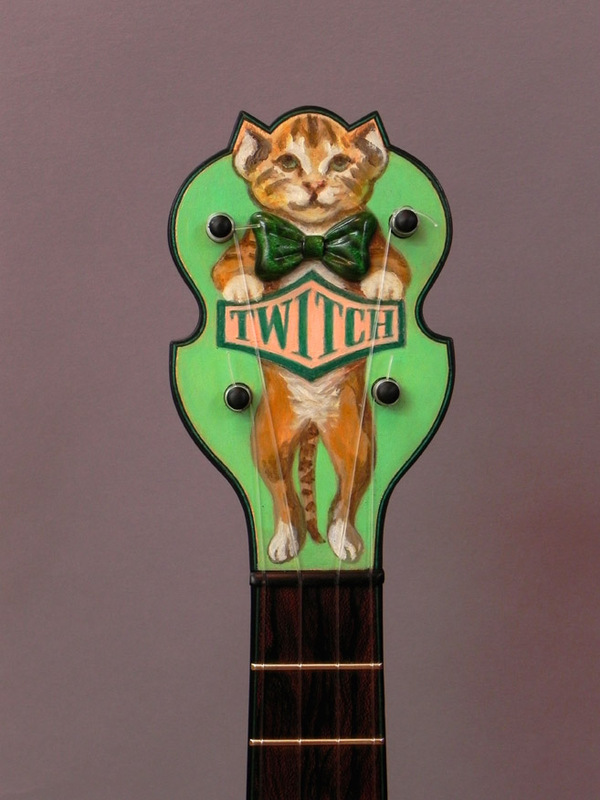 It's a good time to support this man and his art. 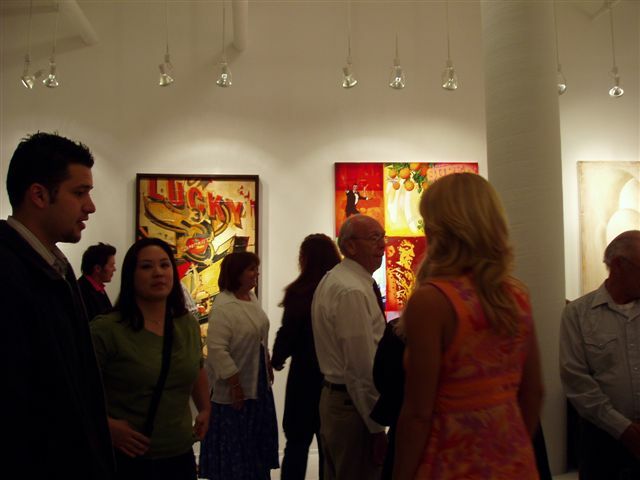 The Monkey Love Paintings all started with the first Blab! Show in Santa Monica, CA. 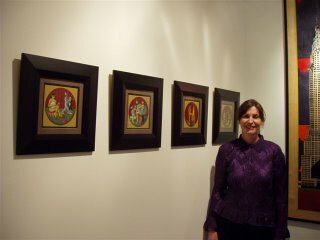 Here I am in front of the three paintings in the Track 16 exhibit of Sept/Oct 2005. 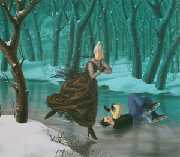 You can see the mysterious "Banana Eater" painting which was bought by a mysterious famous artist and will be a mysterious spread in the mysterious next issue of mysterious "Blab! 17" which comes out in the mysterious month of Sept. 2006. There was supposed to be a mysterious Blab! June 2006 showing of 16 mysterious monkey paintings with 8 mysterious monkey pages in "Blab! 17", but that event got cancelled before it began for mysterious reasons. I have been able to continue the monkey series on my own, however, and I'm finishing up number 8 in the series now. It's called "The Teaser" and I will be posting it next week. There will be another Blab group show in Sept. 2006 and I will be working on those paintings in the weeks & months to come....not necessarily monkeys, but also some brand new works. Stay tuned... as they are bound to be mysterious!! The San Jose Museum of Art in California publishes wonderful art books. 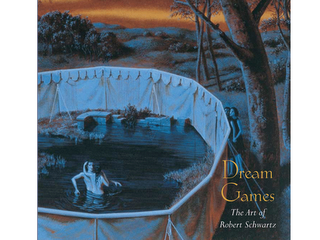 One of my favorite recent books is "Dream Games, The Art of Robert Schwartz". 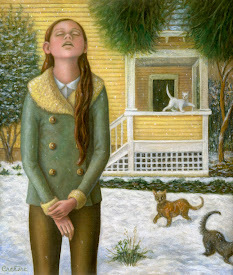 Schwartz was a very unique California painter who died at the youthful age of 53 in the year 2000. His gouache paintings were often no bigger than 8 inches square, but all were packed with tiny details, surreal narratives and ambiguous emotion. I just added a "Monkey Love Store" to my website. I'm now offering limited edition, signed giclee prints of SIX images from my new Monkey Love Series! Boingboing called them "ASTOUNDING"!! 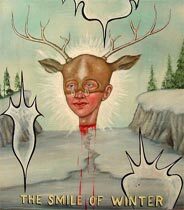 (Mark Frauenfelder) Only 100 in each edition. First orders will be ready at the end of this week. 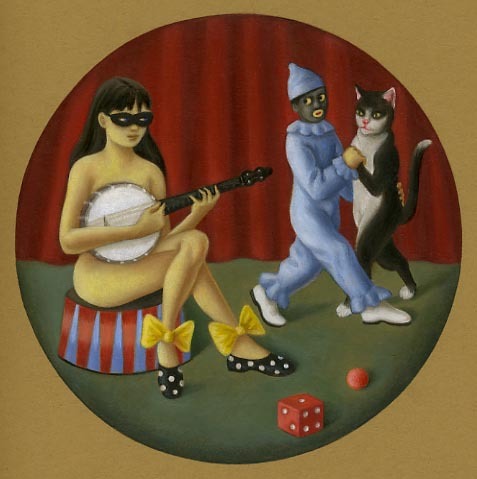 I just recently released two new limited edition, signed giclee prints in my "Little Pierrot" series: "Black Comedy" and "Banjo Gal". They are available now in my "Little Pierrot Store" at amycrehore.com . 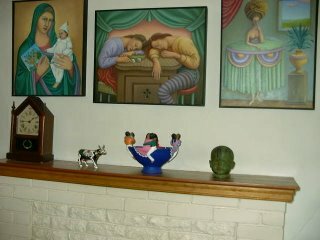 After viewing blog photos of my artwork on display at the Applegate opening, someone emailed me that he would like to see me do larger works. 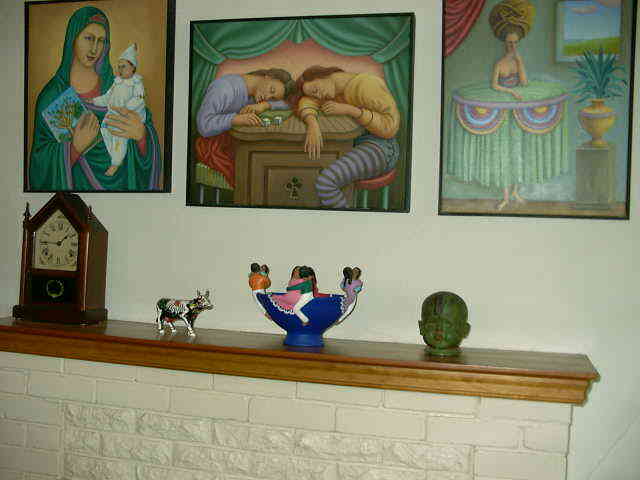 So, I thought I would post just a few of the larger works that I have painted. 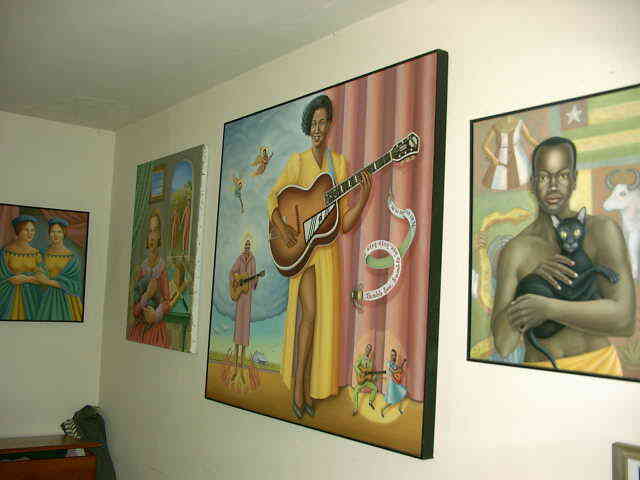 I plan to take snapshots of the interior of my studio as well (for the curious), because the larger paintings shown here are only the tip of the iceberg. 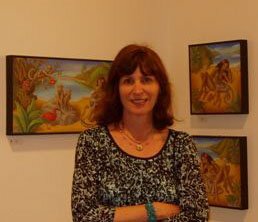 My newer works, the monkeys and the pierrots, are more intimate, delicate works (like medieval Italian painting), but I have been doing larger works all along for many years. All in all, the size of a painting does not matter. It's all about the layering of ideas and the layering of paint, the design elements and the imaginative details, and, most importantly, the injection of feeling into a painting that gives a work of art it's mesmerizing powers. I have to say that one of the biggest thrills of my recent trip to California was driving up to West Hollywood to meet Fred Stonehouse (and family!). He also happened to be having an art opening the same day as mine. His was a solo show at Koplin Del Rio Gallery and I picked up a mini-poster from the show of "Frutti Proibiti". I talked to him (and Sandow Birk!) for about half an hour before heading off to my opening. Later on, after his party was over, he came down to my gallery in Santa Monica to check out my show! Very, very nice man and one of my favorite artists in the true sense of the word. An American original. 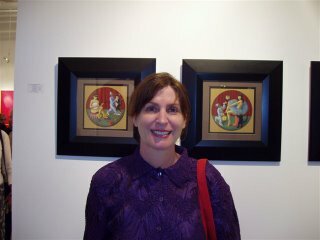 Here are some more photos from the "Aces" show at Applegate Gallery In Santa Monica, CA that opened April 22, 2006.